Addiction Sauces brings a shock of spice to any dish with the award-winning Bhut Jolokia all natural ghost pepper hot sauce. Known the world over as one of the hottest peppers, the ghost pepper satisfies those looking for a rich, spicy kick. 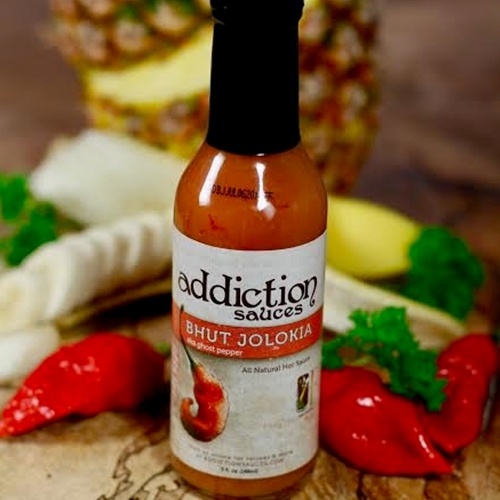 Addiction Sauces combines natural pineapple and banana sugars with a punch of vinegar to round off the ghost pepper twist, making a spicy sauce that adds flavor without overpowering your dish. Bhut Jolokia hot sauce made with ghost chili peppers is the preferred choice for foodies that love spice, and it has been awarded first place in the 2013 Scoville Awards for Louisiana Style Hot Sauce and the 2013 Zestfest People's Preference Award.